2017 was a great year, but for some reason I did not create personal goals for myself last January. I had every intention of doing so, but I blew it off and now I feel like I’ve paid the consequences of missed opportunities…and my favorite jeans no longer fit. 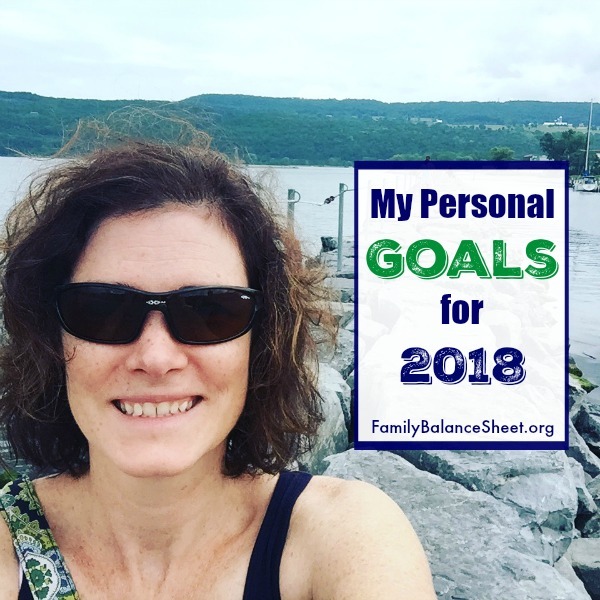 Everyone who rocks goals talks about accountability, so this year I’m sharing a few top personal goals that I made for myself and I’ll update you throughout the year on my progress. My goals are completely attainable, but they will still stretch me to be more intentional with my time. Aside from a health concern with one of my daughters, 2017 was a great year, however, I was distracted by non-necessities, so my overall theme for 2018 is to use my time more wisely on the people and things that are important to me. Time is a commodity that you don’t get back, and I need to make the most of it while my kids are still young and at home. I can loaf on the couch when they leave the nest, but for now I need to focus on my family, my health, and my time. These are just my personal goals. I’ll update you on my family’s financial goals for 2018 in another post. 1) Start my day at 6:00 am, Monday-Friday, and end my day at 10pm. My motivation for waking up early is to have time to complete my morning routine and set myself up for a productive day. To be honest, I initially planned the wake up at 5:30, but switched it to 6 am when I had a heart-to-heart chat with myself. I consider myself a morning person from March through October, but once the colder winter months hit, I tend to hibernate under a massive amount of blankets. Yes, I realize the point of goals is to challenge oneself, however, it’s not worth the mental mind games I will play on cold mornings. I’ll give myself the extra half hour of sleep until March. Update financials. I spend a few minutes each morning paying bills, checking our bank accounts, attending to our balance sheet. This sounds odd, but I keep a close eye on our bank accounts. We were victims a data breach that freaked me out, so I check our accounts several mornings a week. Start first load of laundry. Plan out my day. So far, I love my new 2018 planner! In the warmer months, I will start running in the morning. From 7-8, I get ready for work and get my kids off to school. I usually leave for work around 8:30 after my youngest daughter gets on the bus. Having these few chores done before I leave has been helpful for later in the day. My motivation: To get back to top physical shape. 2017 was the first year since 2011 that I did not run at least one half marathon. It was also the first year in as many that I didn’t write down fitness goals, and the consequence was an increased pant size! Not good! I love (and miss) how I feel when I run regularly. 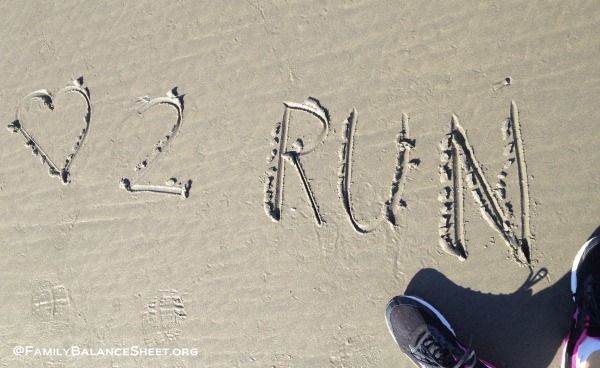 I feel strong and I feel fit, and I know that if I sign up for races, I will hit the pavement or trail. So in 2018, I will run 3 longer distance races. To get the ball rolling, I have already registered for a 10k in April. One race down and 2 more to find. I’m hoping that at least one of them will be a half marathon, if not both. Otherwise, I’ll settle for more 10k races. I actually prefer the 10k, but they’re harder to find for some reason. I started long distance running back in 2011. I enjoyed it so much that I wrote a series, 10 Weeks to a Half Marathon. At the time, the series was quite popular and brought me a lot of traffic at the time, so I plan on updating this year as I train for my next half. 3) Be completely offline from 4pm to kids’ bedtime. My motivation: Focus on family time and needs. This will be my most challenging goal for 2018. I find myself checking my laptop or phone too much in the evenings and most of it is nonsense. Unless it’s absolutely necessary, I plan to be off my phone and laptop during this time. 4) Read one non-fiction book a month for growth and/or devotion. My motivation: Readers are Leaders and Leaders are Readers. I want to grow as a wife, mother, business woman, and I want set a good example for my daughters. 5) Read one fiction every other month for fun. My motivation: for fun and enjoyment. I used to love to read and haven’t read consistently in a few years. I tried unsuccessfully in 2017 to read several books of fiction and found myself having a hard time concentrating on the book. I’m hoping my #3 goal will help make room in my brain to get back to reading regularly. My motivation: the days are long, but the years are short! I have a confession to make. My family of 4 hardly eats dinner together during the week. We EAT dinner, just not as a family. It makes me sad, but with my kids’ activities and my husband’s work schedule, it just doesn’t happen. In 2018, I want to make sure that we are at least eating as a family on weekends and I want to make a big deal out of dinner time on Saturday and Sundays. Growing up, my family ate diner together all the way up until I left for college. My dad walked in the door at 5:30 and we sat down for dinner by 5:45, every night. I can’t give that to my kids, but I can make a better effort at family dinner on weekends. 7) Once a month date night with my husband. My motivation: to strengthen our marriage and ensure its success. Marriage is a lot of work, folks! So often, our kids’ activities take up so much of our time and energy. It’s the season of life we’re in as a couple, and we wouldn’t change any of it. However, we have lost touch at times with each other and we need to make it a priority to get that back, and thankfully, we still like hanging out with each other. What are your Personal Goals for 2018? Please share in the comments. My personal goals for the year are mostly things that seem to always be in progress! But off the top of my head, I’m currently trying to work more to increase my income for upcoming medical/dental/loan bills, get to the gym earlier, decrease my possessions/clothing to simplify my life and try my hand at investing in stocks/etf’s. So far, I’ve been getting to the gym earlier, may have more hours at work opening up so I can take them, still need to make dental appt but I do have MD apt this month and I purchased some stocks/etf’s. The car doesn’t need an oil change for about 6 mths but it will need tires sometime next year. So, I’ll keep an eye on that.